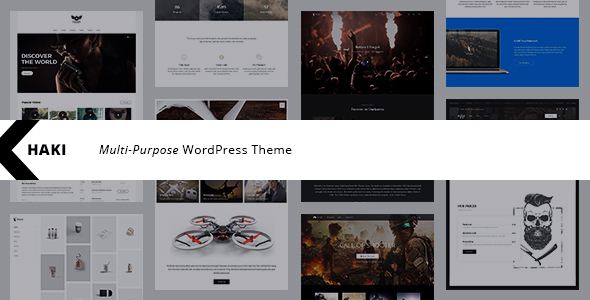 Khaki is Multipurpose WordPress theme with modern design, high performance, responsive & ready to go to work. Start your website in seconds with 9 pre-made demos. Add a portfolio to showcase your work, set up an online shop to sell your products, or promote your business with CTA blocks. A huge number of predefined elements (shortcodes) let you create any website. Play with customizer options and create the unique look of your website with custom colors and google fonts. Not just any demos, these are fully feature loaded website designs with every element you need to create a knockout website based on one of our premade designs. Covering a broad spectrum of business models we are confident there is a good fit for your needs. Take a look now! Are you frustrated with the standard experience that doesn’t translate from desktop to mobile very well? Every swiped at your laptop that doesn’t have a touch screen? Us too. Which is why we designed Khaki with what we call ‘Real Swipe’ menus. They perform exactly like you’d expect with a familiar swipe left or swipe right action across a range of devices, just like magic. Change hundreds of different options from the familiarity of the WordPress backend without any coding knowledge and create a striking new look website simply, and fast. Combine all of these Theme Options with our unique demos with the rest of the killer features of Khaki and you have almost endless possibilities for layouts like you’ve never seen before. From classic to material design and everything in between you’re bound to find you’re style with Khaki. Color and brand are important components of your new website which is why we made it simple to update any combination of colors with the simplicity of our color picker. To make it even simpler for our customers, you can get your new website up and running like any of our demos with a simple 1-click import. How good is that? Taking your web build to new levels with Khaki with your included license of the #1 Drag & Drop Page Builder, Visual Composer + Slider Revolution included in the one off purchase price. Create almost any web element you desire with the Drag & Drop simplicity of the #1 top selling Plugin for WordPress, Visual Composer. Slider Revolution – as they say, it’s not just a Slider Plugin, it’s a new way to deliver ideas. Create beautiful content in a creative way whether it’s a Slider, Carousel, Hero Scene or full page, with this powerhouse Drag & Drop Editor, Slider Revolution has you covered. Without the need for any additional Plugins or Addons, create beautiful menus with the integrated solution in Khaki. Even add background images for a bit of huzzah! Fly in, fly out, fly off! Put your menu wherever you desire, set alignment and add background images if you like. Forget about jerky animations and laggy scroll movements, Khaki has been coded to compliance with the latest technologies and performs at the highest frame rates available today. Your customers will love you for it. Create that sticky experience for your users with our built-in ‘Like’ system that allows users to vote for their favourite content. Not a Pagination fan much (read next, next post, etc etc)? It goes without saying that WooCommerce is number 1 for building ecommerce websites with WordPress. Khaki has been designed, developed and tested to be 110% compatible, and with the additional advanced WooCommerce functionality features including Shopping Cart in Navigation, Product Quick View, Reviews and Overview Blocks, you’ll have a top selling website in next to no time. Build a fully functioning social media network or community with the assuredness of the highly successful bbPress system. No need for additional testing with Khaki, we’ve taken all the hard work out of it for you. Upload and activate the Plugin for a fully functioning system in no time. The industry standard Contact Form 7 Plugin is included with Khaki giving you full control and flexibility for building any type of contact form imaginable. Take your Content Marketing efforts to the next level, build your email list with ease with the integration of the industry best practice email marketing solution – MailChimp. Activate the Plugin, enter your details and embed Subscription forms and other options wherever you like. Take total control over your fonts with the full Google Font library integrated into Khaki, available right across your website portfolio for content, menus, buttons and headings. Nothing pleases the eye more than a stylish Footer. Put your best foot forward with up to 4 columns at the width you set. Fully featured social sharing buttons come integrated with Khaki enabling awesome social media integration that allows you to show counters, show or hide whichever buttons you require. Enable Custom Post types to achieve cool layouts for Posts with Portfolio Events and Playlists as well as the standard offerings. Forget the hassle of updates that take forever and require a sysadmin to log into blah by FTP blah and blah… Asleep yet? Good, forget that stuff, we’ve got Updates covered with our use of a Child Theme and a simple single button click to update your Theme without modifying any of your custom CSS, HTML or settings. Please note: the images that can be seen in the preview will not be included in the download package. These are for preview purposes only.